Marianne, 31, lives in London and is committed to charity shopping wherever she possibly can, even though she works in a high street clothing store! Greenusesforwaste quizzed Marianne about her charity shopping and also asked her for tips. What do you buy in charity shops? If I am going to buy pretty much anything, I will see if I can get it in a charity shop first or at least secondhand in some way. This includes gifts. The only thing I probably wouldn’t buy is underwear! I’d draw the line at that! Why do you shop secondhand? There are loads of reasons really. The main one is that it’s much cheaper! I don’t get paid that much and I don’t want to work longer hours or in a more high-pressured job. Making the most of my money and my time is really important to me. I also don’t like to be wasteful. I would rather use things until they can’t be used anymore than just go out and buy something else. I was brought up partly by my grandma and I think a lot of this attitude comes from her. I am very fashion conscious and I don’t buy charity shop clothes and household items just because they’re cheap – I have to love them too and I am very style conscious. I believe in being discerning about what I buy and only buying things I love and then really looking after them. I love trawling round charity shops and finding that unique thing. I work in a clothes shop and do actually get a large discount on clothes from there. However, I prefer to wear my own outfits put together from charity shop clothes. It’s more unique – in secondhand you’re far less likely to turn up wearing the same thing as someone else and if you did it would be a wonderful coincidence! How do you approach charity shopping? I always keep a running list of things that I am looking out for, for example recently I needed a new work-appropriate dress and I wanted a nice jug and matching glasses. I will pop regularly into charity shops I know and can rarely resist a peek in any new charity shops I see. I am careful not to buy things for the sake of it though. There is always so much gorgeous crockery in charity shops, for example, and if I got all the stuff I liked I would have no space. I always consider whether I have any space and use for an item. If it’s clothes, I try to think of at least three ways I could wear it and I always make sure it fits well. Give charity shops a go. You’d be surprised how much nice stuff there is. Don’t buy things for the sake of it; it defeats the point! Only buy things that you love and will use. Keep a running list of things you’re looking for. Set yourself challenges, e.g. 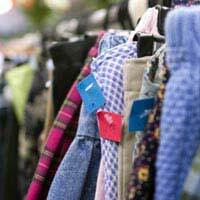 no ‘new’ goods for a month – this can help you get resourceful with charity shops.